If you are looking for reliable heating and cooling system services, look no further than Air Pros Heating & Air Conditioning. 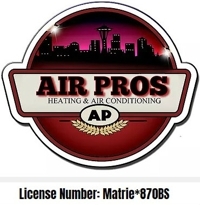 Since 1995, Air Pros Heating & Air Conditioning has been providing exceptional HVAC services to Residential & Commercial Customers. Our experts are capable of designing and installing home heating and air conditioning systems. Whether the job is big or small, our HVAC experts will handle it all efficiently. We deal with specialty work and follow through each project. Our service area includes, but is not limited to, Lynnwood, Seattle, Bellevue, Redmond and Everett. Copyright © 2018 seattleairpros.net All rights reserved.